You're invited! On Saturday, March 9 from 3 PM to 8 PM we're throwing the event of the year in our parking lot jam-packed with good fun, tunes, food, and a little help for Mother Nature. There'll be a Surf Swap where you can bring your surf hardgoods and trade out with your mates. Chat it up with local shaper/celebrities Richard Prause (Grasshopper Surfboards), Paul Martin (Martin Surfboards), and Josh Hoke (Hoke Surfboards). The gang from Nectar Sunglasses will be there along with Live Music from Southern Current. Revelry craft brews will flow thanks to Rita's Seaside Grill, and Coffin Island Catering will be serving seafood gumbo. Jason's Jump Castles will provide bouncing fun for the groms. Register to win a new, Bing Surfboard @ $1 per ticket. Proceeds from the Raffle and Beverage sales go to Charleston Waterkeeper. Be there, or you'll just have to hear what you missed! Holiday surfboard special through dec. 24th! Scoping out surfboards for a loved one.... or wanting to treat yourself for the holidays? GET YOUR BOOTIES IN HERE! We're giving away $100 value with the purchase of a new surfboard until December 24th! It's now become the largest surf contest for 18 and under participants in the state, but the D.J. McKevlin Gromfest started long ago on little more than a whim and a prayer. Nancy Hussey former ESA director for the Southern South Carolina district had come up with a new plan for their yearly slate of competitions. Why not have sponsors for each event? They could help with some of the volunteer positions and bring their own supporters and style along for the ride. When she asked Tim McKevlin of McKevlin's Surf Shop which contest he'd like to help with, his answer came quickly - we want the KID'S contest!!! "I don't know if we can get a lot of kids out for the contest, but we'll try." Nancy immediately added, "Let's name it after your dad!" The deal was sealed, and the D.J. McKevlin Gromfest was born. Few now realize that the contest's namesake may be one of the reasons why surfing has flourished for so long in our area. Aside from opening the longest established surf shop in South Carolina, Dennis McKevlin was Folly Council's "Agitator in Chief" during the late 60's and throughout the 70's. Then, when surfing was frowned upon by the Folly Beach politicals, and surfers were unjustly forced away from the best surfing areas, Mr. Mac began attending Folly Beach Council meetings. There he spoke up for the surfers and reported back to them and their parents and the media about the unwarranted accusations and the bigotry that he saw and heard. Frustrated with the system, he eventually decided to run for office as a Folly Council member. He was overwhelmingly elected and remained on Council for 10 years - until his retirement. While on Council he ran into brick wall after brick wall. More often than not, he cast the lone dissenting vote against a Council determined to cast surfers off the island. Finally, with the help of countless surfers, parents, and others, the issue was taken to the S.C. Supreme Court in 1976 where Folly Beach officials settled with the surfers and allowed them to surf. So, at its roots, the Gromfest is about kids and their freedom to surf. For one weekend of the year, the best surf spot in South Carolina, the Washout, is dedicated to only the youngest surfers. They're given the "keys to the peak" and allowed to have "their day" - all to themselves. Since its inception, the D.J. McKevlin Gromfest has grown in many ways. The earliest events were small but still fun. Gradually, the contest brought more young people into the local ESA district to the point where we can now boast some of the largest younger divisions in the Mid-Atlantic region. The benefits for the participants have also increased. Now, in addition to McKevlin's Surf Shop, this year's event includes 12 other sponsors who have donated prizes for all the finalists. Plus, the top 3 in all 10 divisions is awarded a trophy. Every competitor also gets a Competitor's T-Shirt and an equal chance at winning a brand new McKevlin's Surfboard, regardless of how they place in the contest. In the end, however, it's the final 15 minutes of every Gromfest that usually contain the event's real highlight. This is when the Push 'n' Surf division is held. The absolute youngest surfers, some just scratching at 4 years old and some standing on a board for the first time, are assisted by a parent, sibling, or friend. The assistant guides them out to the break and carefully helps by "pushing" the board and mini-surfer into a wave. The grom's family as well as the entire beach of spectators erupt into a roar of cheers and applause encouraging and rewarding the new star! This division is absolutely free, and all the participants are awarded prizes (in addition to cheers). The 2018 D.J. Gromfest is scheduled for July 7 & 8. Another Folly Beach Wahine Classic is in our rear view mirror. This year's event, like its predecessors, was filled with smiles, fun, sun, and . . . small waves. Hampen Thomas captured 3rd in Girls Longboard, Sylvia Windham took 2nd in Girls Shortboard, and Kristin Tanner posted a 6th in Womens Longboard, a 4th in Womens Shortboard, and was awarded the Hottest Longboard Ride with an 8.1 out of 10 score! Meanwhile, Perng Hutson, the shop's assistant manager, and Kate Barattini, our ambassador of stoke management, went home with the most hardware! Perng received 4th in Ladies Shortboard, 2nd in Ladies Longboard, and a 3rd in Pro Longboard, giving her a $300 check. Kate Barattini won the Pro Longboard division (and a $1,000 check) and took home 3rd place in Womens Shortboard and 1st in Womens Longboard. This contest always draws competitors from all over - not just little South Carolina. Thanks to Co-Directors, Liz Chirles and Patti Dawson as well as all the hard-working judges, tabulators, volunteers, contestants, and sponsors. We're already looking ahead to the 2019 Classic! The Folly Beach Wahine Classic will be held this weekend (June 2 & 3) at the Washout on, where else?, Folly Beach, of course. This is truly a contest where the fun is contagious. If you haven't signed up yet, you may be out of luck! The entry deadline has passed, but if there happens to be room in one of your division's heats, you might get lucky and sneak in. Whether you're competing or not, you don't want to miss this event. Drop by and visit us under the McKevlin's tent. 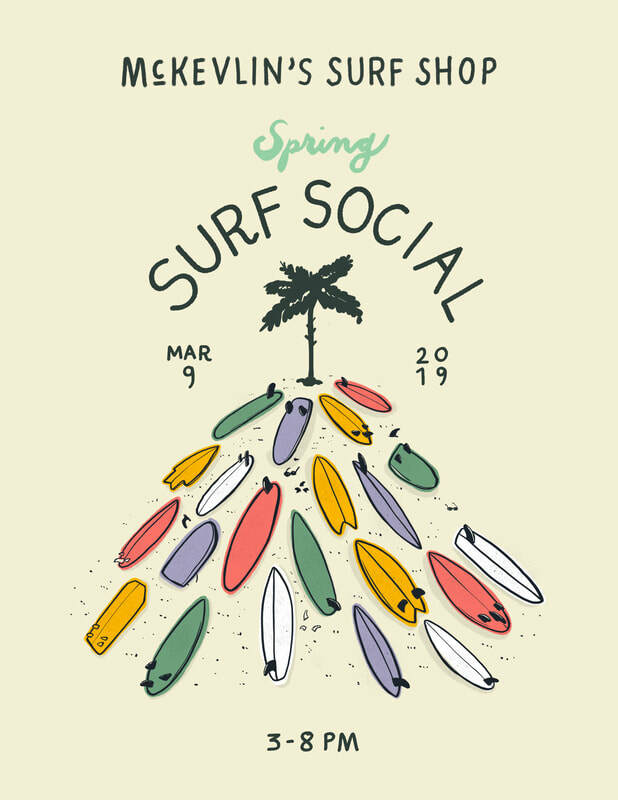 Many of our surf team members (Sylvia Windham, Kristin Tanner, Kate Barattini, Hampden Thomas) will be attending as well as a few of our shop staff (Perng Hutson, Megan Coker, Heather Wall). To read more about these ladies, go: HERE. And, on your way to the Washout, be sure to drop by the shop to enter the 2018 D.J. McKevlin Gromfest. That contest's for 18 and under only and is set for July 7 & 8. The Southern South Carolina district of the ESA held their second contest of the year on May 19, 2018 at the Washout on Folly Beach. This contest was held in better-than-usual contest waves and less than perfect weather conditions! Great for competitors/not so nice for everyone else. McKevlin's Surf Team posted 4 competitors. Sylvia Windham took home the 1st place trophy in Girls U-16 shortboard and in Jr. Women U-18 shortboard. She also scored a 2nd place in Jr. Women longboard. Hampden Thomas managed a 4th in Jr. Women U-18 and a 3rd in Jr. Women Longboard. Also, Kristin Tanner won the Women's division. Representing the male side of the team, Griffin Jackson took 2nd place in Boys shortboard U-16, a 4th in Jr. Men U-18, and a 4th in Jr. Men Longboard. The next contest scheduled is the Folly Beach Wahine Classic on June 2 and 3. Kristin Tanner. Photo by Jimmy Dowds. Thanks to the readers of the Charleston City Paper. We've been named again your favorite Surf Shop. That's 21 years in a row - every year they've run this poll. We are not worthy! But, heck, we'll try to be. Thank you a million times. The first ESA contest of the new season was held at the Washout on April 14 in small conditions. Team McKevlin's managed several impressive results: Sylvia Windham took 1st place in Girls U-16 Shortboard, 3rd in Jr. Women U-18 Shortboard, and 1st in Jr. Women U-18 Longboard. Kristin Tanner scored a 3rd in Women's Shortboard. The guys were successful as well. Griffin Jackson garnered a 2nd in Boys U-16 Shortboard, a 4th in Jr. Men U-18 Shortboard, and a 2nd in Jr. Men U-18 Longboard. Big brother, Mchenry Jackson, dominated with two 1st place wins in both Jr. Men U-18 Shortboard and Jr. Men U-18 Longboard. To find out more about McKevlin's Surf Team, you can go right HERE. Mchenry Jackson. Photo by Matt Drobnik.